The hardiness zone system helps you figure out which plants should survive winters successfully in your garden. A zone, in simple terms, refers to an area with a similar average low temperatures. Plants that are hardy in your region live through the lowest temperatures and whatever else winter weather throws at them. Plant hardiness isn’t determined only on how frigid winter gets. The sum total of your region’s weather patterns – precipitation, wind, sun, summer heat and humidity and winter snow cover – all effect which plants thrive, and which ones don’t. Weather also interacts with topography. Large bodies of water, like the Great Lakes, or the ocean in coastal regions, help moderate temperatures. Most gardeners in North America use the US Department of Agriculture’s (USDA) plant hardiness zone map. The USDA zone map includes Canada and is based on minimum winter temperatures. 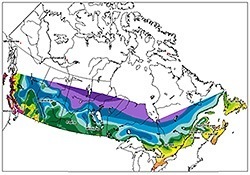 The Canadian map is based on a wider array of meteorological and horticultural information, including observations of what plants grow where, but doesn’t include the US. Just like a thermometer, the higher the number, the warmer the region. For example, a plant rated as hardy to Zone 5 is not recommended for the colder Zones 4 to 1, but can usually be grown into the warmer zones. The USDA hardiness areas have been divided into 11 zones, with Zone 0 as the coldest. Other zones are milder going up to 11, which includes tropical parts of Florida and California. The Canadian map also has Zone 0 as its coldest, but its warmest area is Zone 9. If you are a Canadian gardener, it helps to know both your Canadian and USDA zones because many plants imported from the US have tags listing the USDA hardiness zone. USDA zone numbers are usually one lower: for example, if you garden in Canadian Zone 6, as I do, your USDA hardiness is Zone 5. Hardiness is genetic: Some plants are naturally more tolerant of cold temperatures than others, and some cultivars of the same plant may be hardier because they were bred or selected from plants that are tougher than their cousins. Woody plants: The hardiness zone number is most helpful for deciding which woody plants will grow in your climate. Perennials: With these plants, zones can be misleading. Gardeners often find out they can grow perennials that books say aren’t hardy in their region. Some plants do better in more northerly regions where there is a thick blanket of snow all winter long than in milder regions where winter rain, ice and freeze-thaw patterns can be deadly. Heat zones: Gardeners in the colder regions envy southern gardeners who can grow plants like camellias outdoors. However, northern gardeners enjoy many plants – lilacs, peonies and daffodils, for example – that need a period of cold weather to thrive. In the hot and humid south they sulk and don’t flower. The American Horticultural Society developed a heat zone map to help southern gardeners determine what plants they can grow.